While much has been written on marketing to children, there remains a curious gap in the literature concerning marketing through children. 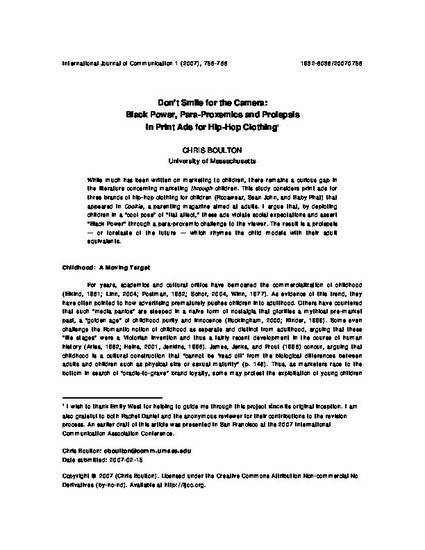 This study considers print ads for three brands of hip-hop clothing for children (Rocawear, Sean John, and Baby Phat) that appeared in Cookie, a parenting magazine aimed at adults. I argue that, by depicting children in a “cool pose” of “flat affect,” these ads violate social expectations and assert "Black Power" through a para-proxemic challenge to the viewer. The result is a prolepsis — or foretaste of the future — which rhymes the child models with their adult equivalents.